dessert | Blog, Jane! Blog! For Christmas I made a Gingerbread cake and it was good, but kind of got lost in all the goodies and food that we had been eating. So a couple of days after Christmas with over half the cake left, I cut it in pieces and stuck it in the freezer. 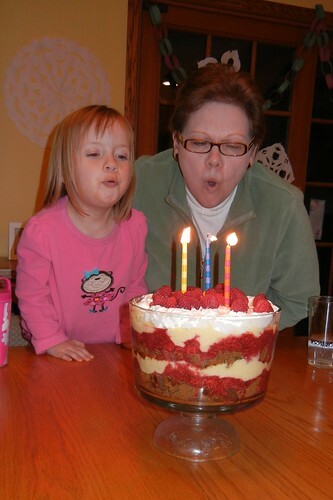 This weekend, Chad’s parents came over to visit Maria after her tonsilectomy and it was his mom’s birthday, so instead of cake, we made a trifle and used the Gingerbread cake from the freezer! How about that?! I wasn’t sure about the flavors of gingerbread and raspberries, but it was excellent! I highly recommend! Gingerbread – a 9×9 or 9″ round cake. Divide the egg yolks and whites by carefully tipping each yolk back and forth between the shell halves, letting the whites spill into a bowl. Place the yolks in a separate bowl. In a large bowl with an electric mixer set on medium-high speed, beat the yolks and sugar until the mixture is pale yellow and thick, about 2 to 3 minutes. Reduce the speed to low and beat in the flour. In a medium bowl, toss the thawed raspberries and sugar. Cut the cake into cubes. Arrange a layer of cake over the bottom of a 2 1/2-quart bowl. Spoon and spread 3/4 cup of the raspberry mixture over the cake, then top the fruit with 1 cup of custard. Repeat the layering 2-3 more times depending on the size of your bowl with the remaining ingredients. Cover the bowl with plastic wrap and refrigerate it for at least 3 hours to let the flavors meld (the dessert can be stored overnight). Before serving, make the whipped cream. In a medium bowl with an electric mixer on medium-high speed, whip the cream with the confectioners’ sugar until soft peaks form, about 3 minutes. Use a spatula to spread the whipped cream on top of the trifle, and garnish it with the fresh raspberries. 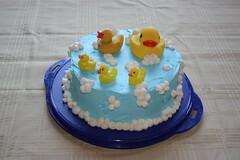 I came across Mel’s Kitchen Cafe blog last week and decided to try this Buttercream frosting recipe for Luke’s birthday cake this weekend. I doubled the recipe and then added a bit more cream cheese just to use the block and it was great. A double batch frosted one 2-layer round cake and 24 cupcakes with about 1/2 cup to spare. 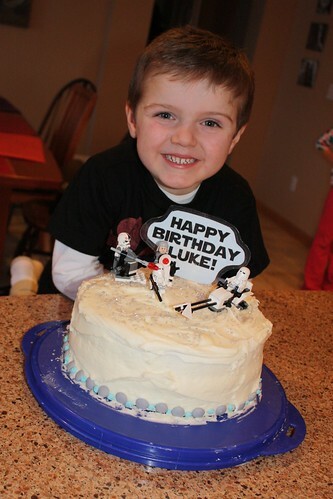 Star Wars cake – easy! Buy a lego snowtrooper kit. Frost cake. no need to make it smooth, because it’s snow. Silver sugar sprinkled on top. Little laminated sign with a Star Wars font. In a large bowl using a handheld mixer or the bowl of an electric stand mixer, beat the softened butter and cream cheese together until it is light and creamy, about 2 minutes. Mix in the vanilla. Add the powdered sugar gradually and mix in fully after each addition. Cream at low speed until well blended and creamy. Pour in the heavy cream and whip until the frosting is light and fluffy. I planted a new rhubarb plant this spring and haven’t harvested much. and even though I already have a super yummy rhubarb recipe, I had strawberries I wanted to use. And now next time I have rhubarb, it will be a toss up. These are both equally good! 2. In a large bowl, mix white sugar, 3 tablespoons flour, berries, and rhubarb. 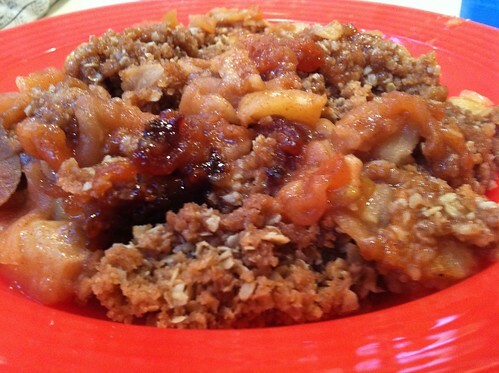 Place the mixture in a 9×13 inch baking dish (or Pampered Chef Deep Dish Baker). 3. Mix 3/4 cup flour, brown sugar, butter, and oats until crumbly. (I used a pastry blender for this.) Crumble on top of the rhubarb and berry mixture. This recipe comes from Pampered Chef Season’s Best Spring/Summer 2005 book. It is an incredibly moist cake and awesome served with strawberries. Great and easy dessert to make ahead! Preheat oven to 350. Spray 9″x13″ pan with cooking spray. Combine eggs, cake mix, and water; whisk until well blended. Spoon batter into pan. Bake 35-45 minutes or until toothpick comes out clean. Cool cake completely. Poke holes all over top of cake using fork or chopstick. Combine evaporated milk, sour cream, condensed milk and vanilla; whisk until well blended. Slowly pour milk mixture evenly over cake; let stand 5 minutes or until mixture is completely absorbed into cake. Spread half of the whipped topping over cake. Refrigerate 30 minutes or until ready to serve. Serve with strawberries. Optional: Garnish with cinnamon and/or toasted almonds.